Over the next several months, you’re going to hear a lot of talk about Sale-a-Bration. You might be scratching your head because you’ve never heard of it, or you might want a refresher. This page will explain everything you need to know! 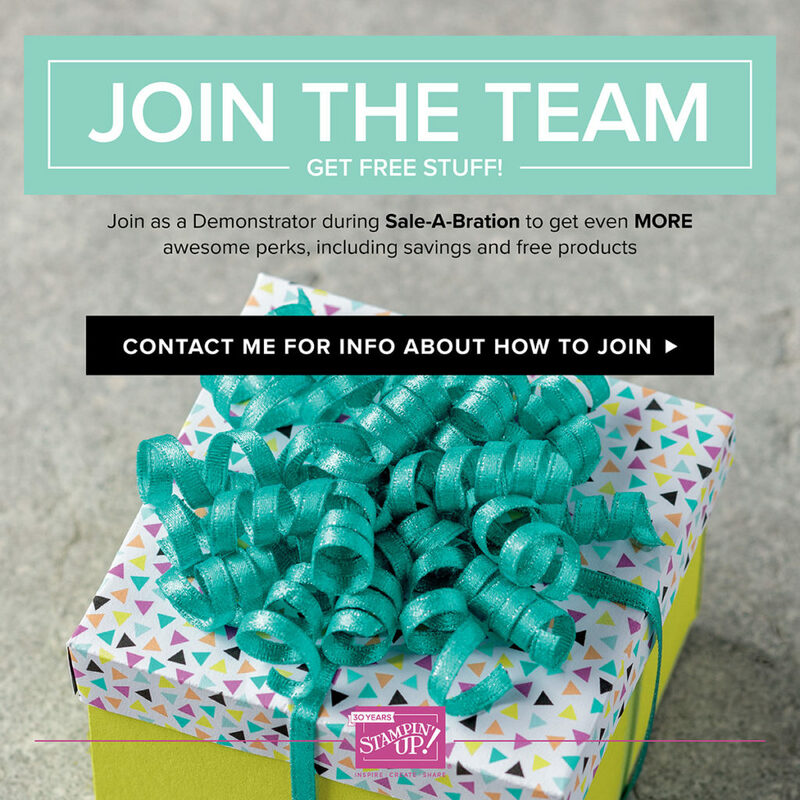 Just what is Sale-a-Bration, and how can you benefit from this event? Who Enjoys Sale-a-Bration? Everyone – but mostly YOU. SHOP: During Sale-a-Bration, you can earn one exclusive item from the Sale-a-Bration brochure for every $50 (before shipping and taxes) of Stampin’ Up! product you buy (includes items you purchase from the Annual Catalog, Occasions Catalog, online items, Weekly Deals or Clearance Rack). If you spend $100, you earn two items. If you spend $150, you earn three. And so on. SWEET! NEW THIS YEAR: A $100 level -look for the $50 and $100 reward level symbols in the catalog. 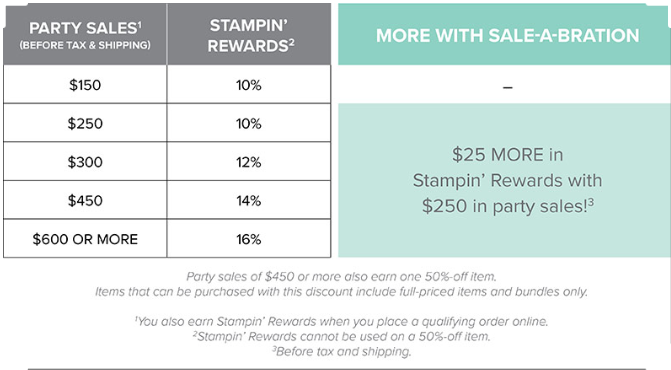 For individual customer online orders or qualifying party orders greater than $250, customers will earn an additional $25 in Stampin’ Rewards during Sale-a-Bration. What a great deal! Between January 3 and March 31, you can select 2 FREE Stamps Sets of your choice when you buy Stampin’ Up!’s Ultimate Bundle. Choose $125 worth of product in your Ultimate Bundle for only $99 (and free shipping). You can join Stampin’ UP! to take advantage of the profitable Business Opportunity, or as a Wholesale Customer to take advantage of all of the perks and to become part of my online Circle of Pals. Added bonus? A 20% discount on future orders you place with Stampin’ UP! AND be the first to see and shop from the 2018/19 Annual Catalog in May 2018. There is no obligation to host a party, or sell anything and you can drop anytime without penalty. Take it for a ‘test drive’ to see if it’s right for you! You’ll save on all of your purchases, make new friends, and enjoy resources and inspiration only available to the Stampin’ Up! family of friends. If you have ever thought about joining, please contact me at Nancy@MyStampinSpace.com with questions or for more info. 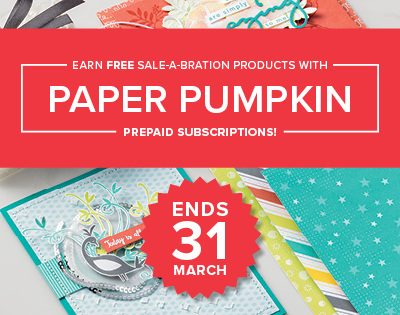 SKIP to the Sale-A-Bration with Paper Pumpkin Prepaid Subscriptions. Keep the creativity coming in the mail all year long. Top Dog: A 12 month Prepaid Paper Pumpkin subscription saves you $24 AND earns you 4 FREE Level 1 Sale-A-Bration items! SWEET, SWEET, SWEET! Where Can You Enjoy Sale-a-Bration Benefits? In the comfort of your home. To purchase from me or join my team, you must be a resident of the United States. When Does the Fun Begin? 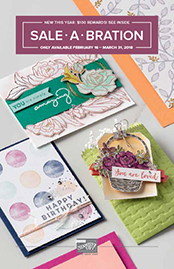 Sale-a-Bration starts when the Occasions Catalog kicks off January 3, 2018. Why is Sale-a-Bration for You? Because everyone loves a good sale, especially you! So, now that you know what Sale-A-Bration is, and all the ways you take advantage of this incredible, once a year sale, HOW are YOU going to save? Will you SHOP, HOST, JOIN or SKIP? If you want a paper copy of the brochure, I offer free copies to all of my customers. 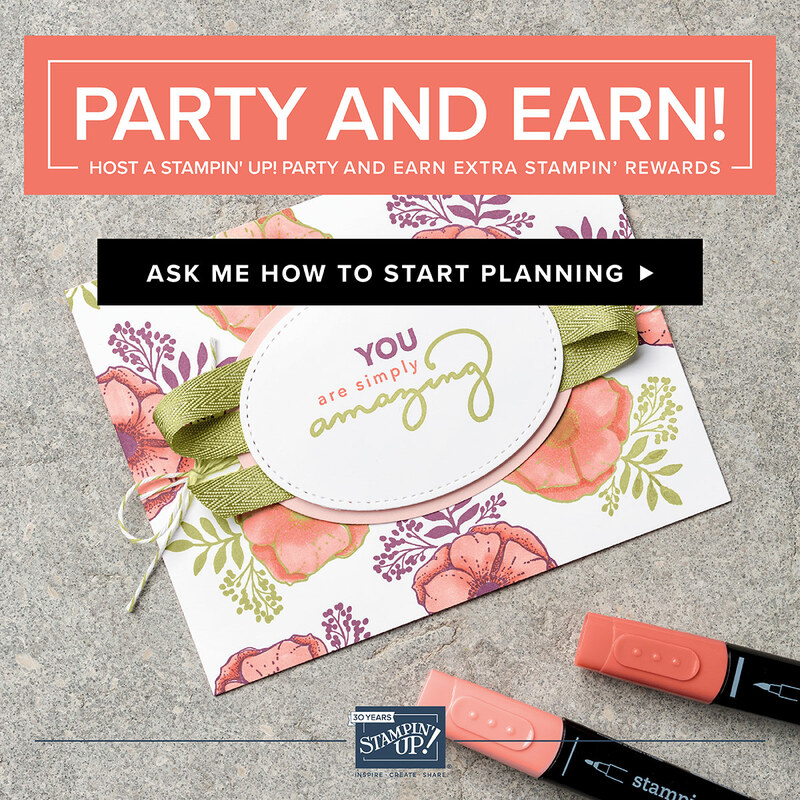 Please email me at Nancy@MyStampinSpace.com if you don’t currently work with a Stampin’ Up! demonstrator and would like to be my customer.